A caddie's main job is to carry his player's clubs. Caddies range from seasoned professionals on the PGA and LPGA tours who carefully chart each course and give tour players advice, to teenagers who earn pocket money lugging golf bags for 18 holes at the local club. As with many professions, caddies have developed their own sub-language over the years, covering everything from working conditions to the types of players they deal with on the job. 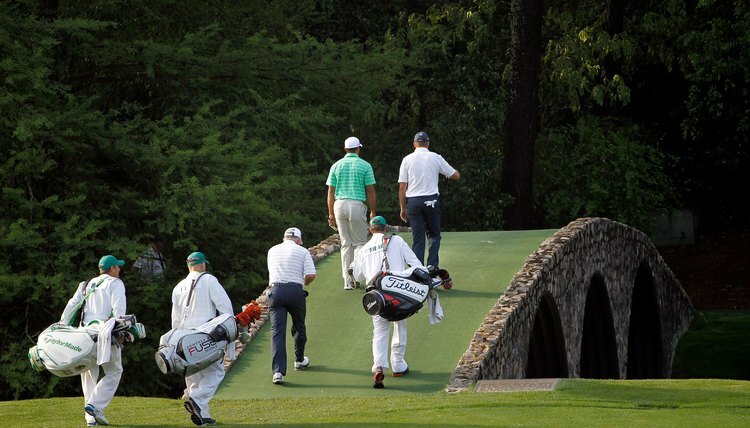 The term “caddie” itself is believed to have originated in France and migrated to Scotland. The word's roots trace to the French “le cadet,” meaning either “the boy” or referring to the youngest male of the family. The Scottish Golf History website also promotes the idea that French military cadets carried the clubs for France’s royal golfers, just as Scottish military cadets did when queen Mary Stuart returned to Scotland from France in 1561. Caddies may refer to themselves as “loopers”-- with “loop” referring to an 18-hole round of golf -- or “bag rats.” A caddie who aggressively pursues work may be called a “bag snatcher,” while “bootjacking” refers to the practice of lurking in the parking lot to seek work from players as they arrive at the course. A “shop rat” is a caddie who shadows a pro in the hope of gaining more work, while a “lifer” is an old caddie. The area in which caddies wait for work can be the “caddie hole” or “caddie yard,” or just “yard” for short. A poor-looking yard is a “caddy shack,” after which the 1980 movie was named. A bag of clubs may be termed “a sack.” A caddie donning an apron-like pullover uniform wears a “bib,” while a full-length caddie uniform is called a “jumper” or a “jumpsuit.” A caddie might suffer from “caddie collar”-- a chafed neck -- from carrying a golf bag with a very thin, wiry strap, called a “dental floss strap.” Caddies must watch for “flying snakes,” or errant shots from players who don’t yell “fore.” And caddies who talk about “clubbing a player” haven’t been violent; they’ve only advised a player about which club to use. Unscrupulous caddies may help players by using a “foot wedge” -- their shoe -- to improve a player’s lie. Can a Golfer Change Caddies During a Round? How Do I Earn a Senior PGA Tour Card? What Does a Golf Caddie Wear? Can There Be Walk-ons in College Golf?